Overlook Galveston Bay and explore the waters below. We're casting nets, gettin' hands muddy, and tasting edible plants of Galveston Bay on our way to an observation tower....Won't you join us? We meet at the Clapper Rail Trail parking area to begin, give a brief orientation, and hand out nets and exploration equipment. Ranger Lisa explores the Clapper Rail Trail from the main parking lot towards the bay tower and boardwalk. 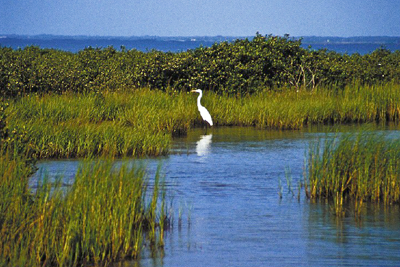 We'll be looking for wildlife, and uncovering the secret values of these wetlands. Help use dip into the shallow murky waters of the estuary and discover life beneath the gentle waves. Freshwater and saltwater mix and meet to create highly diverse wildlife and beautiful scenery on the bay side of Galveston Island State Park. Come learn about this special place with us.